I bought some great buttons this summer! 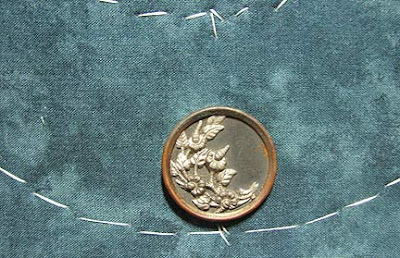 One of my favorite finds was the jar of bright plastic buttons that I told you about before (Question of the Month), but I also found these fantastic steel cut buttons that needed to become something special. 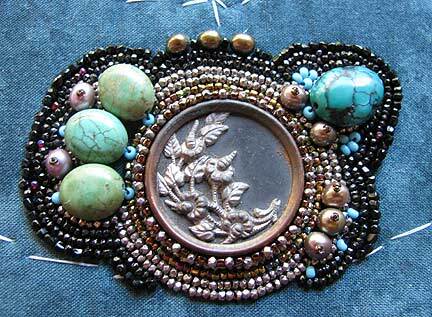 Another fabulous "find" that went into making this piece came from an antique purse that my friend Jean McKenna gave me to salvage. The fabric was rotted way beyond repair, and the steel seed beads that decorated it were falling off by the hundreds. So I used these steel beads along with some other vintage black glass seed beads, each one cut at least twice. 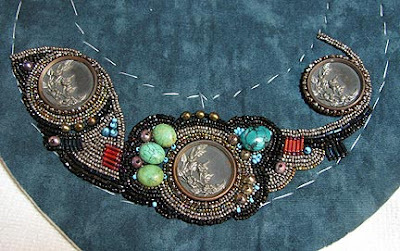 Even though the necklace is going to be dark, the sparkle will be unbelieveable because of these gorgeous antique beads. This will be a very heavy necklace, so I used an extremely thick felt for the foundation. Using fusible webbing, I attached the background fabric. 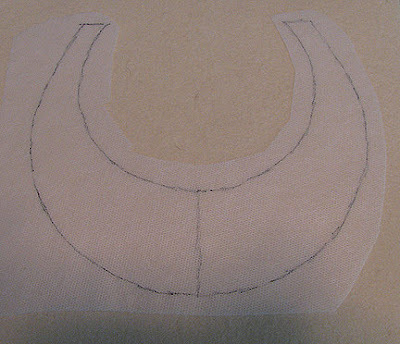 Rather than draw the outline on the fabric, I ran a quick running stitch all around the outside. 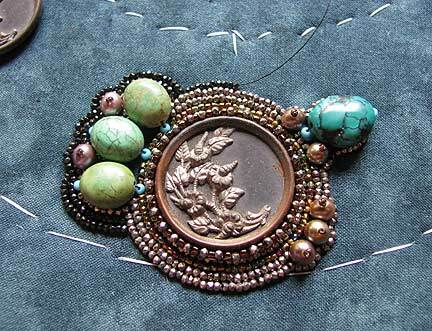 I stitched on the focal point buttons first and then began to bead embroider around them. All of the simple stitches I used can be found explained in detail in the free first chapter of my e-book, Every Bead Has a Story. Great idea. I have had two women give me old beaded bags falling apart too, but I haven't had the time to even think about what to do with them. Now you've not me intrigued & I'm going to have to get those gems out again to look at them. If the fabric is rotting away and a purse can't easily be restored, I think it's a very honoring thing to give those beads new life!